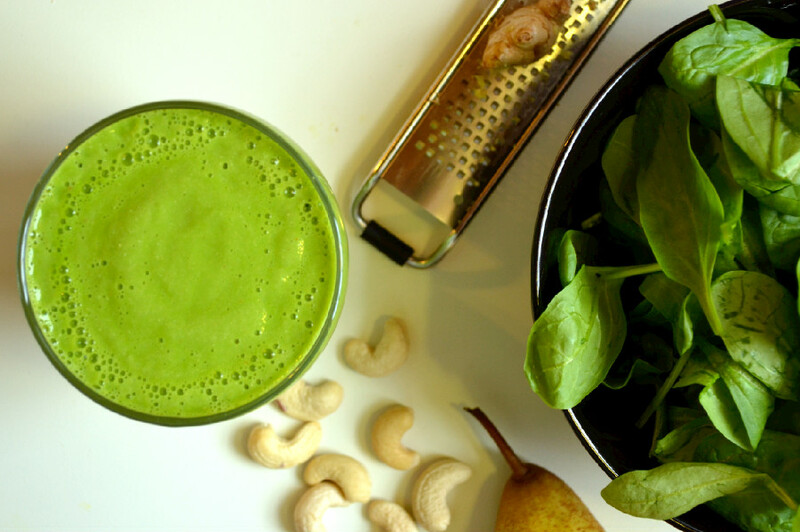 Baby spinach pairs wonderfully with pears (don’t mind the alliteration). Add some fresh ginger, cashews and coconut water and you’ve got a deliciously spicy smoothie to start your day or carry you through between meals without weighing you down. Spinach is loaded with vitamins K and A, and is an important source of vitamin B and minerals such as folate and manganese, to name a few. It’s also a good source of iron and calcium, but its high oxalic acid content unfortunately inhibits our bodies ability to absorb them. 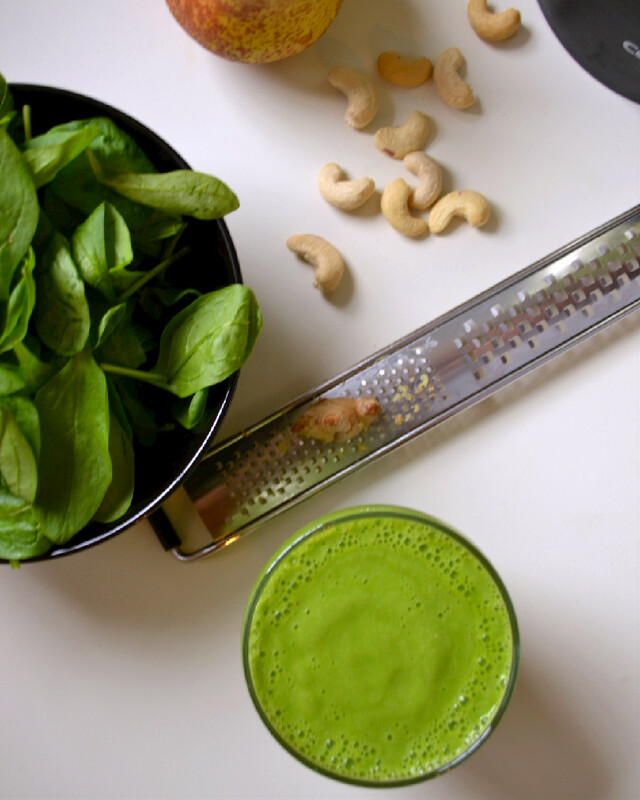 As such it’s best to avoid spinach based green smoothies every day, for several months on end, in favour of rotating it out with other leafy greens with lower oxalic acid; kale, dandelion, escarole, watercress are just a few examples. All of that said, baby spinach is lower on the oxalic acid scale compared to regular spinach, so it’s always the better choice of the two for smoothies, salads and raw consumption in general. In short, moderation is key, even when it comes to greens. So enjoy this smoothie, but don’t over do it like I’ve been doing this week. Addicted! 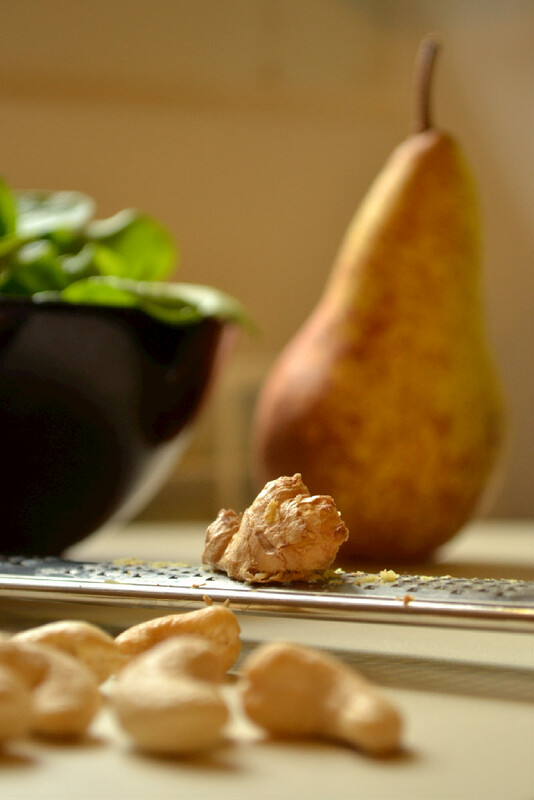 The ripe pear sweetens the deal and the skin is loaded with antioxidants and powerful anti-inflammatory properties. 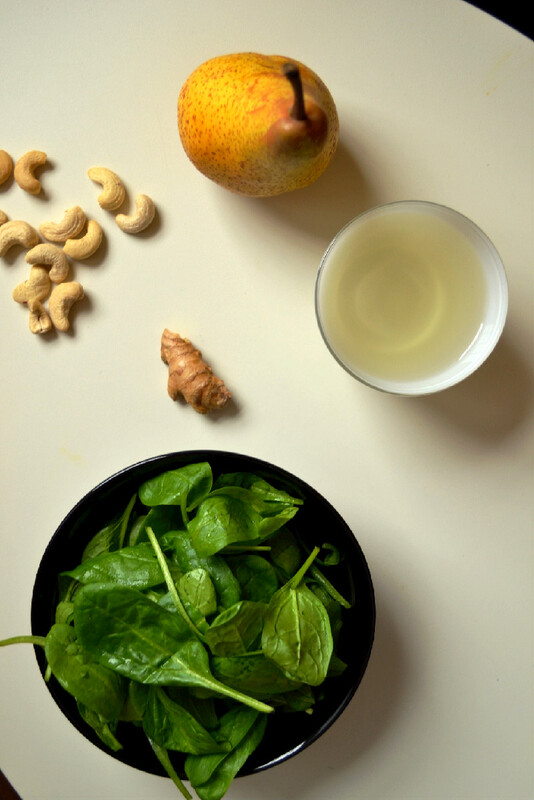 The ginger adds a kick while helping to keep your digestive system in check and the coconut water, among many of its wonderful characteristics and benefits, gives you a healthy dose of electrolytes to keep you hydrated. The cashews add flavour and blend well with the coconut water forming a cashew milk and lending a creamy texture to the smoothie. Add all ingredients to a high-speed blender in the order listed and blend until smooth and creamy.